PANDORA has produced some eggtastic charms ready for Easter! The PANDORA US Engraved Charms just keep on coming and we now have two cheerful easter charms to add to the collection! First we have the PANDORA Easter Basket Charm which is a sterling silver button design that is surrounded by cubic zirconia stones. The front of the charm depicts a brightly coloured Easter Basket filled with Easter Eggs. The details are in black, pink, yellow, green and blue enamel. 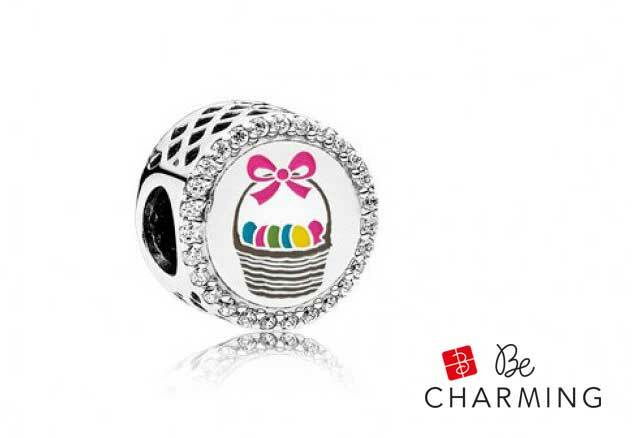 The PANDORA Easter Basket Charm is a US Exclusive Charm. It is available for $75 USD from our preferred PANDORA retailer BeCharming.com. The PANDORA Easter Chick Charm is a fun sterling silver heart shaped charm that features a pale yellow fluffy chick on one side with a cute pink bow in her hair! 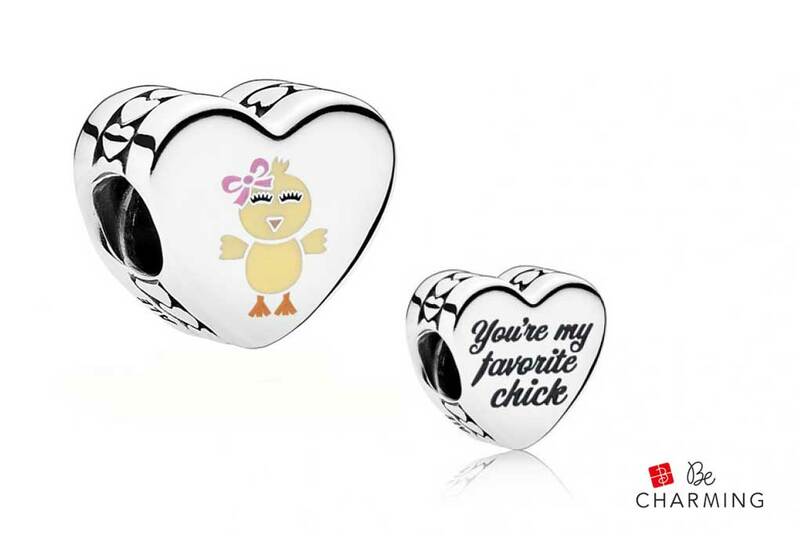 The reverse of the charm includes the engraved message “You’re my favorite chick” which make it an ideal gift for your BFF! The PANDORA Easter Chick Charm is a US Exclusive Charm. It is available for $65 USD from our preferred PANDORA retailer BeCharming.com. 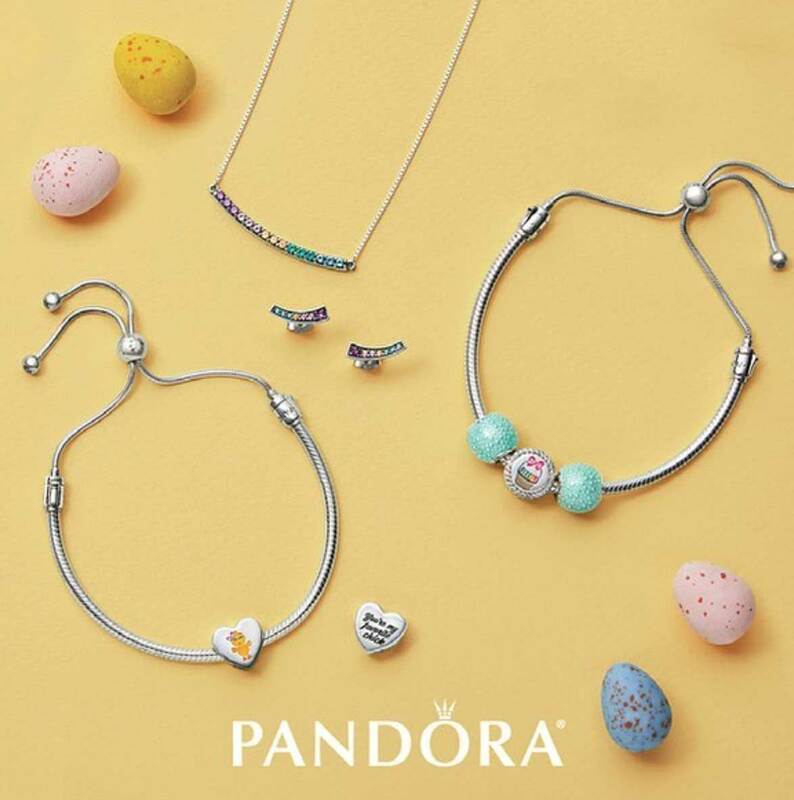 Both the Easter Basket and the Easter Chick charms would look very cute teamed with the new PANDORA Spring 2018 Collection. The Iridescent Rainbow Murano Glass Charm, Rainbow of Love Charm and the pretty Hearts Charm would look charming with the colourful enamel details on the Easter Charms. If you wanted a more subtle easter theme you could team the Easter Charms with the adorable Enchanted Garden Glass, Dreamy Dragonfly Charm, Spring Bird House, Promise of Spring Charm, and the Enchanted Tea Pot. The release of these new PANDORA Easter Charms is perfect timing to take advantage of the PANDORA US Save More Event which starts on the 22nd of March and will be available at our preferred PANDORA retailer BeCharming.com. 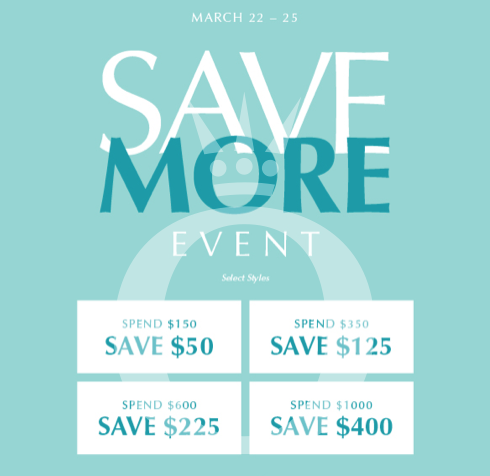 If you would like to purchase the new engraved PANDORA Easter Charms and take part in the Save More Event, but live outside of the US, you can purchase from the BeCharming.com and use a mail forwarding company, like Borderlinx, to forward your offer to you. Read more on our Global PANDORA Shopping article. What is your favourite PANDORA Easter Charm? What other engraved designs would you like PANDORA to produce? Let us know in the comments below. I think the second one is so funny and kind of inappropriate :p.
It is a bit cheeky! I would not like being called a chick by a man but it’s ok coming from a girlfriend. Did PANDORA Belgium never create designs on their engravable charms? It seems that PANDORA in each country can set up a relationship with an engraving company. There is normally only one company chosen. In the UK it’s John Greed Jewellery.